Dr. Norfleete Day has been named 2013 Distinguished Master of Divinity Alumna by Samford University's Beeson Divinity School. She was presented the award by Beeson dean Dr. Timothy George at a service on February 5. Day was a member of Beeson's first entering class of students in 1988. She received her M.Div. degree in 1993 and later earned a Ph.D. in New Testament from Baylor University. 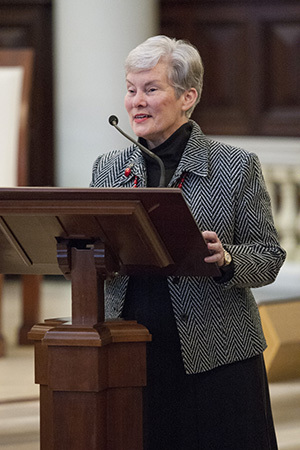 She returned to teach at Beeson in the areas of biblical studies, including Hebrew and Greek, and spiritual formation until she retired in 2009. The U.S. Navy veteran also holds a master's degree in library science from the University of Alabama. In presenting the award, George cited Day for her "exemplary and faithful service in the academy and in the church of Jesus Christ."